Breeding density for Bald Eagles (Haliaeetus leucocephalus) in the lower Chesapeake Bay has been shown to vary with salinity. Shoreline areas surrounding low saline waters currently support higher breeding densities and have experienced faster rates of population recovery compared to areas surrounding higher saline waters. 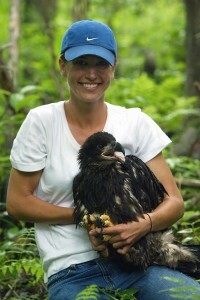 This finding has broad implications for eagle management throughout the region. However, the ecological factors that contribute to this distribution have not been investigated. We examined the influence of salinity (tidal fresh vs. mesohaline) on Bald Eagle diet composition, chick provisioning, and chick growth during the 2002-04 breeding seasons. We investigated diet and chick provisioning patterns by installing video-monitoring systems above nests along tidal-fresh and mesohaline reaches and recording nest activity 4 d/wk during the period of maximum chick growth. Videotapes were reviewed to quantify prey use and delivery rates. Prey were identified to the lowest taxonomic level possible and sizes were estimated relative to eagle bill length. We used species-specific, length-weight relationships and energy density values for prey to produce rates of biomass and energy delivery. We quantified chick growth by taking chick weights during two visits during the expected phase of exponential growth and fitting this data to a growth model to produce estimates of maximum growth rate, asymptotic weight, and time required to grow from t10 to t90. We found that patterns of chick provisioning and growth were influenced by salinity but that the composition of diet was not. In general, provisioning rates were higher in mesohaline compared to tidal-fresh salinity zones and nestlings along mesohaline reaches grew at faster rates and achieved greater asymptotic weight compared to nestlings in tidal-fresh zones. These findings suggest that Bald Eagles nesting along mesohaline reaches are more successful at meeting the energetic demands of brood-rearing compared to pairs nesting along tidal-fresh reaches. This finding is consistent with a recent investigation that has documented higher reproductive rates and proportion of three-chick broods along mesohaline reaches compared to tidal-fresh reaches.